1. FLOUT DOSE COUNTER – MODEL – 100R-LCD – Counts each time dosing tank liquid discharges. Control Panel with built-in 8 digit liquid crystal display with recessed manual reset. Flashing red LED indicates tank is discharging, Green LED in fill mode. Plug-in ports for probe cable and 12V power supply. 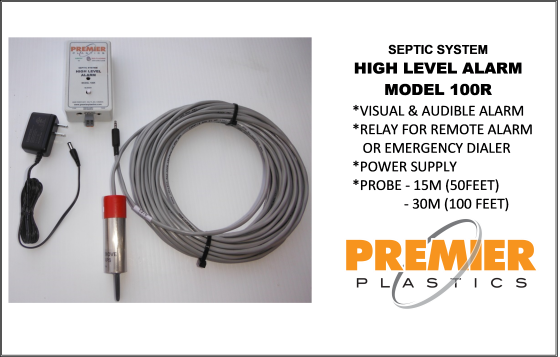 Terminals for external data logger (if required). Sensor probe comes with 50ft. cable (100 ft. optional) and mounting strap. 110V / 12V plug-in wall adapter power supply. 2. HIGH LIMIT ALARM – MODEL 100R – Warns when liquid level gets over normal operating level. Control panel with status indicator LED. Built-in alarm buzzer with manual reset. Terminals for remote external siren and/or emergency phone dialer. Sensor probe with 50ft. cable (100 ft. optional) and mounting strap. 3. 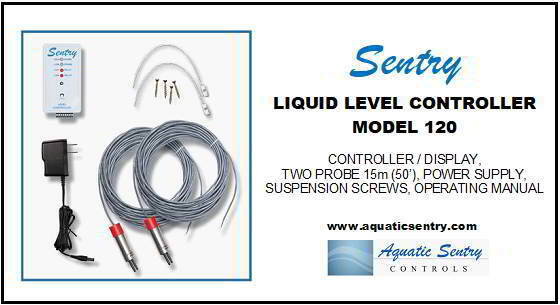 LIQUID LEVEL CONTROLLER – MODEL120 – Cycles pump for tank filling or draining (specify which). Control panel LED’s show status of each sensor probe and output relays. 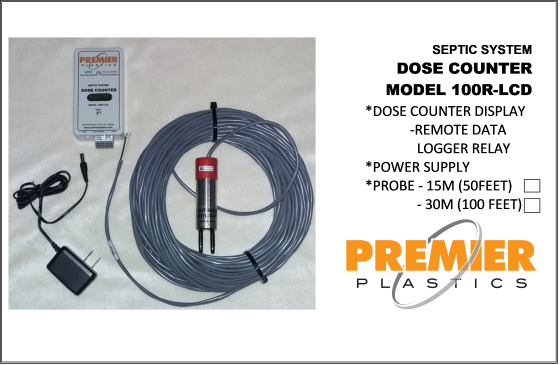 Two sensor probes (high/low) come with 50ft. cable (100 ft. opt.) each and mounting strap. To print a pdf version of this private label LV Device, please click here. MOUNTING OF ELECTRONIC DOSE COUNTER PROBE FOR ‘FLOUT’ DOSING SYSTEMS. Position probe as shown in photo below. Set probe so that the prongs are one above the other, and above the other, and both are just below the top face of the dosing head when sitting horizontally. The prongs must lift quickly out of the effluent when the dosing head refloats at the end of the cycle. At this point the counter advances. During filling, the prongs are held out of the effluent until the dosing head sinks at the start of the next cycle. Strap the cable to the 3″ pipe a few inches from the dosing head to limit movement where it enters the probe. Ensure the connecting cable is free to move with the dosing head and will not tangle or restrict the movement of the dosing head as it rises and falls. Reset counter to zero if necessary after installation is complete. Consider the use of an OMEGA OM-EL-USB-5 Data Logger to record time of each dose up to approximately eight years. Battery needs to be replaced once per year. Note: Do not freely suspend the probe in the effluent as an alternative method. The switching function can flutter on and off when the slow filling level ‘hovers’ at the switching point which can cause a false reading. Please contact the factory if you have any questions. To print a pdf version of the above instructions, please click here.